With their high-profile jobs, teachers and administrators particularly are prone to online reputation damage from detractors. Those in the educational community have a more challenging job than most in managing their online reputations. Teachers, principals and other administrators shouldn’t let others control the conversation that determines their professional and personal destiny. ReputationSimple, the leader in reputation management, can ensure only the best material appears at the top of every search. It’s sadly an all-too-common scenario: A superintendent is unwittingly caught up in a scandal. A teacher is wrongly accused of inappropriate behavior. A principal strives to protect his school community only to be attacked online unfairly by uninformed critics. In the digital age, anyone with a grievance can go online and make any statement they please – whether it’s true or false. Any time someone types that administrator or teacher’s name into a search engine, he could get a skewed, unflattering view of the individual and situation. Without a proactive approach, that impression will be immediate – and lasting. As so many have learned the hard way, the Internet and social media can be a minefield. Given the unfiltered, instantaneous nature of modern communication, no education professional can afford to neglect her online reputation. While there’s no way to totally erase poor online reviews and commentary, it doesn’t have to be the first – or most prominent – information someone sees during a search. ReputationSimple is the leader in suppressing negative results – and portraying a client in the best possible light. How does suppression work? It’s simply a matter of creating positive content that supersedes the critiques in search results. For instance, let’s say that a spiteful ex-employee brings a frivolous lawsuit against a school district and administration after being fired. The local media reports on the suit, and it’s eventually dismissed, but those named in the coverage are still associated with it in cyberspace. 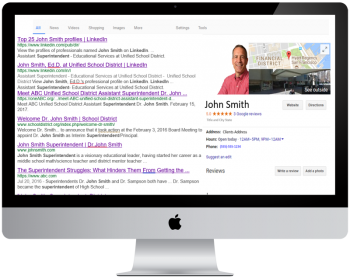 When searchers Google these educators’ names, the suit likely will be front and center in the results. The most effective fix in such situations is to let ReputationSimple highlight their qualifications and accomplishments with fresh postings, crafted to ensure they rank highest. The undesirable results are pushed down to the point where they are no longer damaging. If you notice that your online buzz needs cleaned up, you may not know how or where to start. That’s where ReputationSimple can eliminate the stress with a proactive, proven strategy – tailored to each client’s unique needs. A thorough online reputation assessment and a plan for improvement are available quickly – minimizing the time any harmful content stays at the forefront. Controlling your personal brand means having a complete, 360-degree view of your online presence. Wherever possible, show both detractors and searchers that you not only are aware of what’s being said – but that you’re committed to correcting any issues brought to your attention. Almost everyone has been affected by disparaging remarks on the Internet, and being oblivious is a problem that must be addressed first. Courteous responses to criticism usually are better than appearing disengaged. If you encounter significant trouble that only a professional can address, contact ReputationSimple right away and start rescuing your reputation. Given their role of nurturing and teaching youth, those in the educational field must be more mindful than most about their digital footprint. Even the most scrupulous teachers or administrators can find themselves unexpectedly embroiled in a controversy through an ill-timed or poorly thought-out tweet. No one can fully control what others say – especially online – but everyone can monitor how they’re perceived and be cautious in their own online activity. Teachers and administrators should know at any given time what will happen – and how they will appear – when someone looks them up. It’s a common mistake to only think about this topic when looking for a new job if at all. Online reputation always matters – especially when someone is accountable to parents, students, a school board and a community at large. Post wisely, avoiding subject matter that can incite dispute, be misconstrued or not reflect your values and those of the school community. According to one study, about 33 percent of Google traffic goes to the first result listed. More than 90 percent of searchers don’t venture beyond the first page. Every item on page one should give a glowing impression. Above all, be an active contributor, not a passive observer, to the conversation about you and your professional activities; make your voice the loudest. And don’t wait until a crisis hits to protect your good name. It’s up to you to keep your online reputation pristine. ReputationSimple helps control your digital footprint and reputation narrative to dominate page one with positive and engaging results. Since 2013, ReputationSimple has been enhancing online reputations by providing done for you review collection services, reputation management as well as staff reputation training and support.